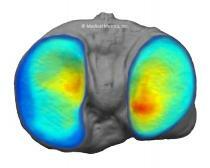 MMI is an experienced imaging core laboratory for orthopedic clinical trials. Since 2000, we have supported more than 150 orthopedic device and biopharmaceutical companies internationally, including 13 of the top 15 global market leaders. We have evaluated scores of unique treatments for disorders for the hip, knee, ankle, wrist, shoulder, peripheral joints, and long bones involving OA, trauma, and sports medicine. We specialize in quantitative image analysis using validated, computer-assisted methods. Our image analysis techniques include cartilage thickness mapping, MR relaxation mapping, joint space analysis, bone density analysis, and assessment of tissue morphometry. We are also exprienced with all of the major semi-quantitative scoring systems to assess disease severity and response, including MOCART, MOAKS, WORMS, OARSI, and K-L.
We offer unique clinical expertise, awareness of the latest advances in imaging, and knowledge of current regulatory trends in orthopedic device and drug trials. 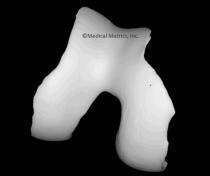 Our core group of orthopedic experts is led by Drs. Timothy Mosher and Mark Schweitzer. We offer techniques to assess the composition and quality of cartilage. 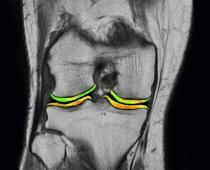 We can reliably measure knee cartilage thickness from MRI. We can segment knee cartilage in 3D from MRI with minimal artifact.